What is Shrove Tuesday or Pancake Day? Shrove Tuesday or also known as Pancake day is the day in February or March immediately preceding Ash Wednesday (the first day of Lent), which is celebrated in some countries by consuming pancakes. In others countries, especially those where it is called Mardi Gras this is a carnival day, and also the last day of “fat eating” before the fasting period of Lent. Pancakes and crepes are associated with the day preceding Lent because they were a way to use up rich foods such as eggs, milk, and sugar, before the fasting season of the 40 days of Lent. The liturgical fasting emphasized eating plainer food and refraining from food that would give pleasure: in many cultures, this means no meat, dairy products, or eggs. It has recently been suggested that, pancakes, in Christianity, symbolize “four pillars of the Christian faith—eggs for creation, flour as the mainstay of the human diet, salt for wholesomeness and milk for purity.” However, this is a false etymology. Christinity does not have “pillars”, and ‘creation … diet … wholesomeness and … puity’ would be an odd selection if it had. Better candidates are found in Acts 2:42. “They devoted themselves to the apostles’ teaching and to the fellowship, to the breaking of bread and to prayer”. In the UK Pancake Day is a very popular day and people are eating crepes on that day. 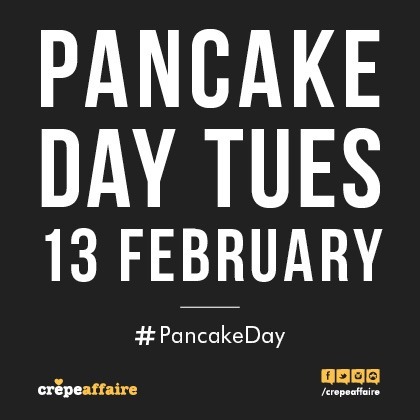 Crepeaffaire is waiting for you to celebrate Pancake Day this Tuesday the 13th of February!